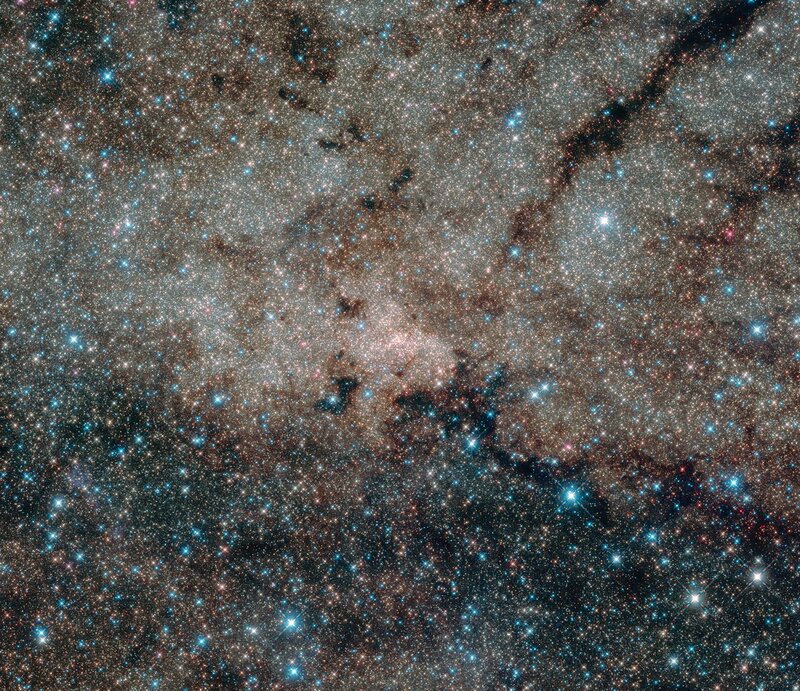 The centre of our Milky Way seems to be a very crowded region. A massive stellar system, called a nuclear star cluster, dominates the innermost 30 light years, harbouring in its centre a supermassive black hole (SMBH) weighing more than 4 million solar masses, called Sgr A*. Nuclear clusters are thought to form, at least in part, through repeated collisions among massive star clusters born in the inner galactic regions. During the past 12 billion years, also the Galactic Centre itself may have been the site of such cataclysmic events, giving rise to one of the densest stellar systems of the Universe known to us, comprised of more than 20 million stars. Massive star clusters are also ideal nurseries for the formation of stellar black holes (BHs), with masses of 10 - 100 solar masses, and are thought to be the most likely birthplaces for intermediate-mass black holes (IMBHs), truly enigmatic objects with putative masses in the range of 100 - 100000 solar masses. But if the Galactic nuclear star cluster was formed indeed by a series of collisions of several massive clusters in the past, the Galactic Centre might have been contaminated with their “dark” content, possibly affecting the dynamics of the inner galactic regions. A study recently published by Dr Manuel Arca-Sedda (Astronomisches Rechen-Institut, Zentrum für Astronomie der Universität Heidelberg, Germany) and Dr Alessia Gualandris (University of Surrey, UK) investigated this still obscure aspect of our home Galaxy. The two astronomers presented a theoretical model of the evolution of a massive star cluster spiralling toward the centre of the Milky Way, assuming that it hosts either an intermediate-mass black hole or a significant population of stellar black holes. These models have one of the highest resolution levels ever achieved with high accuracy numerical simulations running on Graphic Processing Units in the field of galactic nuclei dynamics. Each of these simulations would have required a time about 50 times longer to be completed on a common desktop PC. Figure 2: Simulation snapshot in two different models. Top panel refers to a model in which the cluster contains an IMBH, while the model shown in the bottom panel represents a model in which the cluster contain a sizeable population of stellar BHs. As the black holes in the simulation are deposited close to the SMBH they interact strongly due to the SMBH intense gravitational force. This interaction leads to the emission of gravitational waves, ripples of spacetime predicted by Einstein's General Theory of Relativity and only recently observed by the international LIGO/VIRGO detector. “Our model suggests that the Milky Way may have witnessed the coalescence between its central supermassive black hole and an intermediate-mass black hole a few billion years ago, resulting in a now-long-gone burst of gravitational waves. Additionally, our central black hole may have captured thousands of stellar mass black holes, forming tight binaries (tightly bond pairs of black holes), which will surely be detected by future observatories like LISA. We found that during the formation of the nuclear star cluster the central black hole Sgr A* might have captured as many as 3800 BHs in ''extreme mass-ratio inspirals'', tight binary systems that will be crucial sources of gravitational waves", explains Dr Arca Sedda. Dr Gualandris adds "If the BHs delivered in the Galactic Centre form tight binaries, SgrA* would mediate their coalescence on very short timescales. This is the first time in which the disruption of a star cluster is directly connected with the coalescence of black hole binaries." With this study it is also possible to estimate the average rate of these interactions between the central black hole and smaller ones in Milky Way like galaxies. This information is quite crucial for astronomers working on gravitational waves astronomy, as it determines the estimated number of events to be seen. It suggest that BH binary coalescence in Milky Way - like galaxies can occur at a rate of 0.4-4 events per year, while the larger IMBH-SMBH mergers are much less probable, at about 1 event every 357 years. This however infers that the gravitational detector system LISA will potentially see 1 BH-SMBH mergers every 4 years. The results described here were published in Manuel Arca-Sedda and Alessia Gualandris, Gravitational wave sources from inspiralling globular clusters in the Galactic Centre and similar environments in the journal Monthly Notices of the Royal Astronomical Society. This work was supported by the subproject Z2 of the Collaborative Research Center (Sonderforschungsbereich) SFB 881 "The Milky Way System" at Heidelberg University. Collaborative Research Centers are long-term research projects funded by the Deutsche Forschungsgemeinschaft (DFG) for up to 12 years. The research work of SFB 881 revolves around our own galaxy, the Milky Way, a typical spiral galaxy and hence a member of the most common class of massive galaxies in the universe. The scientists involved in the SFB investigate the origins and evolution of the Milky Way and its surroundings in order to clarify fundamental principles of galaxy formation. The SFB 881 is located at the Zentrum für Astronomie der Universität Heidelberg (ZAH) and includes scientists from the Astronomisches Rechen-Institut (ARI), the Institute of Theoretical Astrophysics (ITA) and the Landessternwarte Königstuhl (LSW). The participating non-university research institutions are the Max Planck Institute for Astronomy (MPIA) and the Heidelberg Institute for Theoretical Studies (HITS). In addition, the Haus der Astronomie (HdA) helps to make research on the Milky Way accessible to the general public.